A “yizkor book” is a genre of book written in memory of a specific European town and its Jewish population exterminated during the Holocaust. These books, written in a mixture of first-person and third-person, started to be published shortly after the war in the late 1940s and continued at their peak until about the 1980s. Rather than a strict historical overview of a town, these books contain personal tributes to individual families and the “everyday” former Jewish inhabitants. Yizkor books were written mostly in Yiddish and Hebrew and are invaluable to Jewish genealogists because they often compiled names of all the murdered families. “Yizkor” (יזכור) means remembrance in Hebrew and is the name for a memorial prayer. Have you checked if your town (shtetl) has a yizkor book? The first step is to read this blog entry to find whether your town has an untranslated yizkor book. Or just contact me with the name of the town/towns your family comes from, if you want me to quickly provide you a list of the yizkor books out there. As a professor, I can even gain access to the book for you through my university’s interlibrary loan at no cost to you. 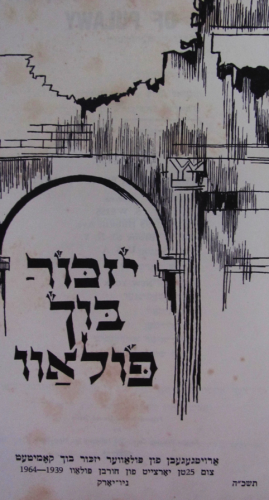 There are various approaches to translating Yiddish yizkor books. I would suggest that you hire me incrementally to getting this project done, depending on your goals. My rate is $0.14 per word of the final English translation. What is your goal with this translation? Follow the instructions at this blog entry on how to contact other researchers listed in the JewishGen database as having familial connections to your shtetl and who might be interested in contributing to a yizkor book translation. Once I put a description of the book at the yizkor database site with the table of contents, the families you contact could contribute to a specific section. Sourcing funding for an entire book will lead to the book being translated in portions over a few years. For this, I would initially translate the table of contents for you at my per-word rate. You would then let me know if one or more chapters interest you. Here is a sample table of contents for a yizkor book from the town of Rzeszow, with the already translated portions hyperlinked. Contact me to talk about your goals and I will provide you with a free assessment of your options.